Data reports are essential to your business, yet they can be a real pain in the neck. The thing is, though, they don’t have to be this sickening. In fact, they don’t have to be sickening at all, when done right. And by “done right”, what we really mean is “done using DashThis”. Say goodbye to your old reporting ways, what follows is about to change your whole reporting game. Wouldn’t it be nice to be working hand in hand with a fully automated tool that takes care of your data reports without you having to even lift a finger? Well, dream no more, for this is exactly what DashThis has to offer. Not only does DashThis allow you to build your reports automatically, it’s also focused on getting it done quickly and according to your standards, by offering a vast amount of amazing performance-oriented features. With DashThis, there’s no need to bother your IT specialist every now and then to get the whole thing working; our tool is simple to use. Everything we build is based on user-friendliness in order to get your data reports done as smoothly as possible. We know you most likely get your data from several sources, so this is why DashThis is connected to the most popular digital marketing tools out there. Need to add your own data into your reports? It’s no problem, we also offer the possibility to import CSV files, allowing you to find literally all your data in one place. Hundreds of marketers have already upped their reporting game using DashThis and have nothing but praise to give their new data reports, as well as our outstanding customer-success team. Join the movement now! One thing’s for sure, features are something DashThis certainly isn’t lacking, and each of them is bound to take you a step closer to being the marketer you’ve always wanted to be. DashThis is a promise to help you save hundreds of hours and find the time to focus on insights that help you grow your business. How much do you think this is worth? Darn straight: it’s priceless. 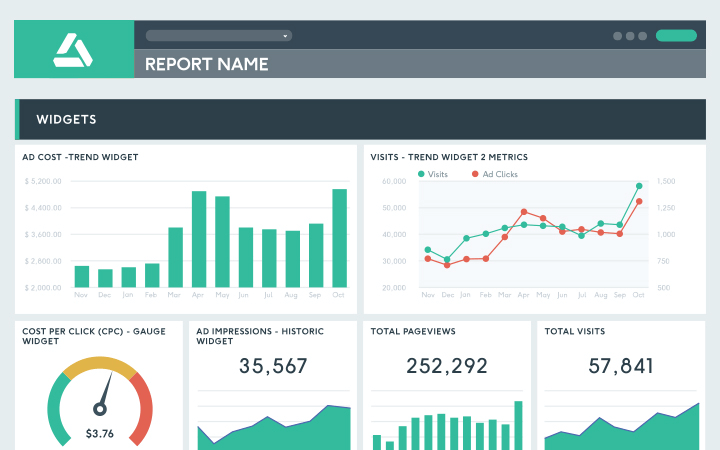 Get a fully personalized white label data reports design that reflects your brand’s colours, fonts, and overall vibe. Save on a custom URL and design with a white label bundle that includes both! Data reports just the way you want! Read our blog for more data reports related content!